Situated along the border of Ambient, Trance and World Fusion lies the genre of Tribal Ambient. 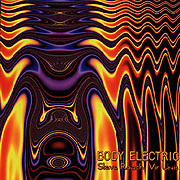 Body Electric, the new CD by Space Pioneer Steve Roach in collaboration with Groove Master Vir Unis, falls comfortably into this newly established domain. With an emphasis on rhythm and pulse, the electricity generated on Body Electric may be static for some and electro-neural for others. Although this release lends itself to movement in space, the better journey will be purely cerebral.